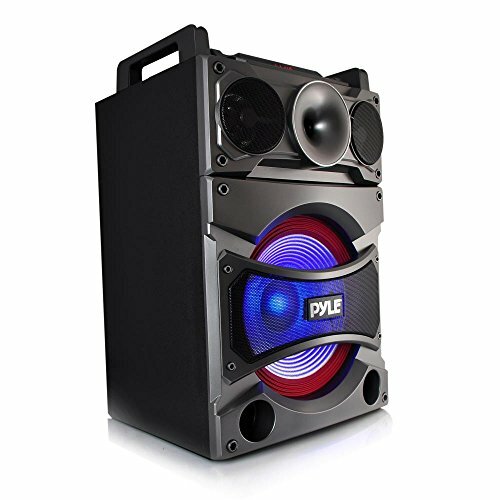 Pump up the party with the Pyle Karaoke Speaker Systems. Enjoy plenty of music streaming options that will add life to any occasion. Included wireless microphone makes it perfect for sing-along karaoke parties, Bluetooth audio streaming plays all of your favorite songs wirelessly, and the built-in flashing DJ party lights add visual effects to the high-powered sound! Use the system at home, on stage or in the auditorium -- it's perfect for all of your audio and crowd control needs. Convenient carry handle and rolling wheels allow you to easily transport the speaker system to quickly post up and party! Additional features include, USB & SD Memory Card Readers, FM Radio along with the ability to connect additional microphones. Get the party going with the Pyle Disco Jam 2 Speaker Systems!